Candidates for the 2017 Junior/Senior Prom at Chadron High School are: Marcus Burwell, Alexandria Nobiling, Daniel Smith, Danielle Johnson, Michael Gieseler, Kyla Parish, Keegan Shuck and Greta Welch. The theme of this year's prom is: Get Your NEON! Prom is Saturday, May 6th at the Chadron State College Student Center. The grand march will begin at 7:00 p.m. followed by coronation. Chadron High School English teacher, Willie Uhing was recently named the 2017 recipient of the Freda Battey Distinguished Educator Award for Excellence in Teaching. A University of Nebraska - Lincoln committee of students and faculty awarded Mr. Uhing stating they were impressed with his reflection on teaching and his commitment to student learning. Former CHS alum, Alida Johnson nominated Mr. Uhing for the award. Mr. Uhing will be honored at a luncheon at the City Campus Union on May 5, 2017 at 11:30am. The Freda Battey family will present him with a beautiful school bell and a cash prizes for both himself and Chadron High School. Mr. Uhing has been asked to give a short presentation of the focus of his teaching for this occasion. We're excited to introduce and share information about our newest CHS Club, 'Native Futures' which meets weekly. 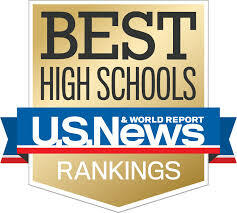 We're proud to announce that Chadron High School has again been ranked as one of the top high schools in Nebraska by U.S. News & World Report for 2017! Chadron Senior High School is ranked 5th within Nebraska. Students have the opportunity to take Advanced Placement® course work and exams. The AP® participation rate at Chadron Senior High School is 25 percent. The student body makeup is 54 percent male and 46 percent female, and the total minority enrollment is 24 percent. Chadron Senior High School is the only high school in the Chadron Public Schools. Chadron Senior High School is recognized in the National Rankings and earned a bronze medal. Schools are ranked based on their performance on state-required tests and how well they prepare students for college. 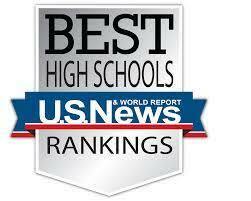 Read more about how we rank the Best High Schools. Lacrosse in CHS PE Classes! 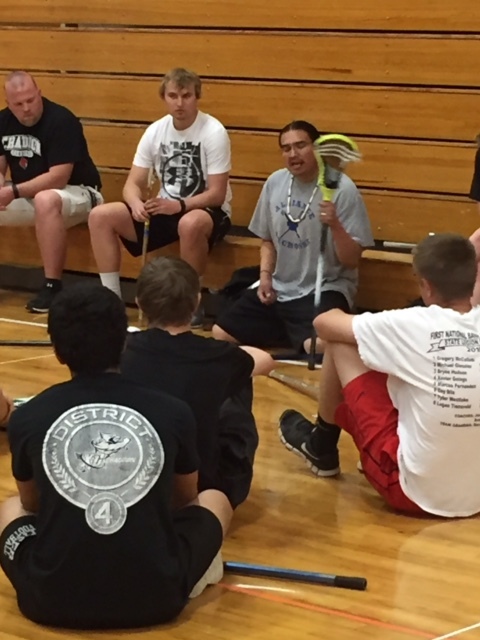 Thank you to Edison Red Nest III for sharing the history and knowledge of the game of Lacrosse during PE classes this week. Edison shared the origins of this tribal game played by Native Americans and how it was modified by European immigrants to North America to create its current collegiate and professional form. While 48 CHS students were in Lincoln and Omaha competing in events for the state FFA and FBLA conventions, another group of students were on the CSC campus Friday, April 7th competing in the annual Scholastic Day Contest. Chadron students did exceptionally well ...again! Chadron finished 2nd in a close race with Bridgeport in Division III team scoring. (From the School Nurses) Sports physical forms/letters went home with students yesterday (April 11th). Here is the note we attached. The High School sports physicals are scheduled for May 2, 2017 at 7am in the High School Gym/locker room area. Parents/guardians please fill in the Health History and sign permission at the bottom of physical form. Please return completed form to school by April 21, 2017 along with $5 donation. Your student MUST have the form signed and returned to receive a physical. Three CHS Students Qualify for National History Day Contest! Three Chadron High School students qualified for the National History Day contest in Washington D.C. which will be held this June. Sydney Brown: 1st place individual website titled, The Hubble Space Telescope, she wins a scholarship to Nebraska Wesleyan. Lauren Collins and Grace Sorenson: 1st place group website and Honorable Mention NebraskaLand Foundation special award. Their title was, The Ghost Dance: Taking A Stand Against The White Man. Cathy Kaus and Mary Traphagan sponsor/teach the Chadron History Day students. Chadron FBLA Qualifies 7 for National Competition! The Chadron High Future Business Leaders of America attended the annual State Leadership Conference in Omaha on April 6-8. While at the conference, students participated in a big business tour of Renze Display, listened to the keynote speaker, Hoan Do and attended a variety of workshops. But most importantly, Chadron students competed amongst all class levels in many different business competitions. This conference was attended by over 2,200 students and advisors this year. Chadron FBLA had a another year of success and brought home an abundance of awards. 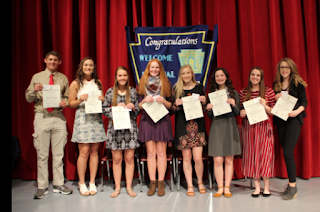 Seven students that placed at the state level are now given the honor to represent Nebraska at the 2017 National Conference in Anaheim, CA in June. 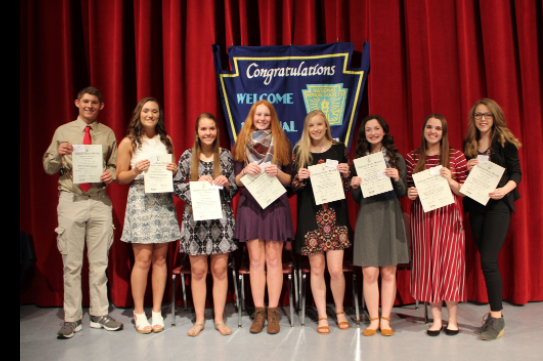 Congratulations to the following students inducted into the National Honor Society on Monday, April 3rd: Dana Dunbar, Kylee Garrett, Alpine Hickstein, Joe Matt, Sydney Brown, Abigail Hyer, Claire Margetts and Kellie Waugh. Also, thank you faculty, staff and students for attending the ceremonies.